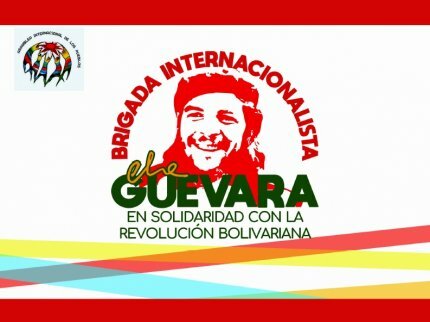 From the exchange of experiences and voluntary work between diverse social movements of the world and the Bolivarian Republic of Venezuela, the “Che Guevara” Internationalist Brigade of solidarity and militant character has been formed, in solidarity with the Bolivarian Revolution. Nearly 200 young activists from around the world (North America, Central America, the Caribbean, South America, Sub-Saharan Africa, the Arab Region, Asia and Europe), will participate in encounters with the Venezuelan people in their daily struggles, both rural and urban, entering into what is the construction of People’s Power and the communal path to Socialism. Likewise, the international brigade will share activities with political actors, mainly young people, in government functions, as well as with different youth organizations with national presence, from Saturday 16 to Friday 22 February, as a prelude to the International People’s Assembly, which will take place from 24 to 27 February 2019. Taking into consideration that in Venezuela there has been an attempt to consummate a coup d’état against the constitutional government of President Nicolás Maduro, through a strategy of prolonged fourth generation war of economic and financial blockade that generates a shortage of food, medicine and other essential goods and products, the international delegates have among their objectives to establish a platform in solidarity with the Bolivarian Revolution, at the world level, that sustains a permanent political and communicational articulation, generating tools for the effective handling of information, as well as the planning and execution of specific actions, in defense of the right to self-determination of the peoples, counteracting with this, the advance of the imperialist hegemony. In the same way, they aspire to learn the Venezuelan reality from within their territory in order to demystify what is really happening in Venezuela, thus dismantling the false information matrices, the consequence of international media manipulation. In addition, they will seek to contribute substantially in the preparation of the brigadistas, for what will be the participation of the Youth in the International Assembly of the Peoples. What is an Internationalist Brigade? The Brigades arise because of the need to build an internationalist identity that transcends nations. They are organized in the 1930s in the Soviet Union and in the midst of the Spanish Civil War. Since then, the planetary struggles for the liberation of humanity have been marked by the presence and active work of Brigadistas all over the planet. These Brigades are active in countries where there is a greater need for solidarity, voluntary work and political articulation between popular organizations and progressive governments.